Nicholas Stix, Uncensored: Foreign Criminals Heading to America Launch Lawfare from Mexico, Suing Trump, Government, Asserting that Their “Constitutional Rights” are being Violated; Invaders Now Enjoy Help from a Once-Unlikely Ally—Fox News! Foreign Criminals Heading to America Launch Lawfare from Mexico, Suing Trump, Government, Asserting that Their “Constitutional Rights” are being Violated; Invaders Now Enjoy Help from a Once-Unlikely Ally—Fox News! Keep in mind the names that worked on this reportorial, which only cites opinions that support the lawfare: Edmund DeMarche, Amy Lieu, Gregg Re and the Associated Press. When you think of Fox News now, you have to think of pc sons James and Lachlan Murdoch, not their father, founder Rupert, who is now a mere figurehead. “The Fifth Amendment states that, ‘no person… shall be compelled in any criminal case to be a witness against himself, nor be deprived of life, liberty, or property, without due process of law.’"
“A recent PBS report cited former Supreme Court Justice Antonin Scalia, who ruled in 1993 case that "it is well established that the Fifth Amendment entitles aliens to due process of law in a deportation proceeding." Nexus Services Inc. is funding the lawsuits through a civil rights law firm called Nexus Derechos Humanos (Human Rights) Attorneys Inc.
"Federal law enables migrants to apply for asylum in the United States. President Trump and his administration have used ‘increased enforcement,’ like separating families and lengthening detention to violate migrant rights," Mike Donovan, president of Nexus Services, said in the release. There is another legal issue at stake, according to the lawsuit. The U.S. cannot send troops into Mexico to cut off the caravan from crossing the border, it said. Even with the National Guard at the border, once an immigrant indicates an intention to apply for asylum, the suit maintained the process has begun. Immigrants who are seeking asylum must be referred for a “credible fear interview,” for which an asylum officer would determine if the immigrant has a “credible fear of persecution,” the lawsuit said. If the officer makes that determination, then there is a significant chance for the asylum-seeker to be granted asylum, according to the suit. Yes,the only way to stop them is to intercept IN Mexico.Senor Trump must negotiate such a deal to show these wanderers that they cannot walk freely to the US--The US AND Mexico will turn them back,long before they get close to our border. Give Mexico extra money(aid)to do carry out such a plan--it will save us much more money in the long run. 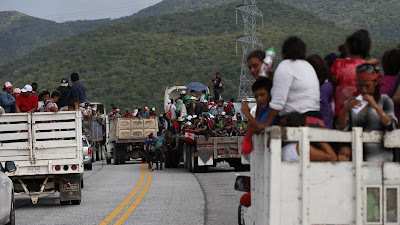 Give Mexico an ultimatum: stop the caravan in Mexico or US troops will stop the caravan IN MEXICO. It is my understanding that they must apply for asylum at the border and they cannot do it if they never reach the border. Note the wording in the title. School reports "boy" (as if it's a fact the migrant is a child) to authorities over fears he is a 30 yr. old asylum seeker. The assumption is he's a "boy" and the school is already the bad guy for "reporting him to authorities". The word "fear" is another cleverly placed word, makes them sound unreasonably hysterical. I'm going to guess it's pretty obvious this guy is way overage because otherwise they wouldn't place his suspected age at such a high number. If he actually looked young enough they would have said he's suspected as being over 18. Some diversity fanatics heard him say "child" and passed him along because their ideology says they "must" help migrants, no matter they are frauds and endangering children. Usually any danger to children is good reason to be "hysterical" and over reactive except when they are endangered by migrants, Muslims and blacks, then their rights as a protected diversity class take precedence. I expect that kind of verbal chicanery with liberal media outlets, they do that crap all the time but I expect better of Fox, and more and more of late, Fox has been letting us down. A thirty year old passing as a fifteen year old? Well, the illegal does process of a lot of what is called brass nerve. I guess these illegals in Mexico DO have a right to sue? The courts did rule that Muslims in countries as listed by Don for the temporary travel bad DID have rights. Precedent was set? Again, one more thing to thrown a monkey wrench into the legal process.